There is no doubt that Brad’s has the tastiest asparagus around, but how can you keep it fresh and delicious once you get it home? Here are 5 easy ways to store and prepare asparagus from Brad’s Farm market! Enjoy! Fresh Storage – Store in the refrigerator upright in a bowl with enough water to cover the bottom 1/2” of the stems. Use within 3-4 days. Freezing – Wash thoroughly and let dry. Cut ends off and blanch (cook in boiling water for 1 minute). Immediately place in ice water to stop cooking. Freeze on baking sheets until frozen and then place in appropriate containers. Freeze and use within 8 months. 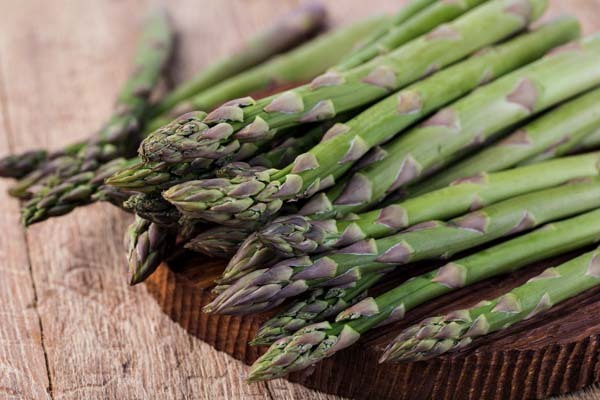 Stovetop – Place in a steamer basket over boiling water until the asparagus is bright green and tender; 5-7 minutes for thick asparagus and 3 to 5 minutes for thin stalks depending on your preference. Microwave – Wrap washed, trimmed stalks in four layers of paper towels. Wet and squeeze to remove excess water. Roll and lay the bundle in the microwave. Cook on high 3-4 minutes. Use tongs to remove the bundle from the microwave. Roast – Toss with olive oil and place on shallow pan. Roast at 425* for 12-15 minutes. Season as desired.